Always having a close relationship with Ferrari, due to their proximity in Italy, Maserati planted the MC12 on the Enzo Ferrari exotic sports car chassis. So the Maserati has bona fide performance DNA at its core. The body and engine tuning was all Maserati, but at its heart is a true Ferrari heartbeat, a 6.0-liter Ferrari V12 mounted at 65 degrees. Top speed is said to be 205 mph out of the box, with 620 horses and 481 ft.-lbs. of torque pushing it toward any race circuit’s first corner. It was a success early on, winning a race at the Zhuhai International Circuit in China, and built on its successes from there. Body styling mostly came from Frank Stephenson, but was based on Giorgetto Giugiaro’s basic shapes developed in Maserati wind tunnel tests. Naturally, the engine is in the rear to help balance the car for precise racecar handling. The MC12 is wider and longer than the Enzo Ferrari it’s based on, but uses a giant spoiler on the tail to increase maximum downforce for high-speed cornering. This model is of the No. 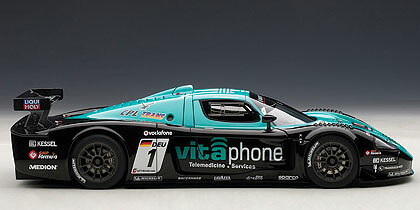 1 MC12 that the car’s Italian development driver, Andrea Bertolini, and German Michael Bartels drove to the GT1 World Championship in 2010. 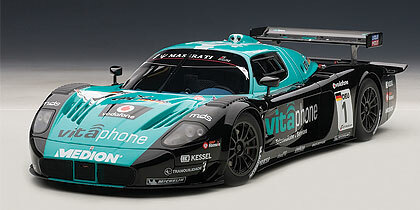 This particular model reflects how it appeared at the race on the Paul Ricard circuit in France. You gotta love the car’s overall look and its spectacular paint job. Autoart tells us each model goes through 123 free-hand sprays along with 70 mask sprays. There are 108 hits of tampo printing to make sure the Maserati trident logo, and all the sponsors names, is perfectly affixed to the roof. 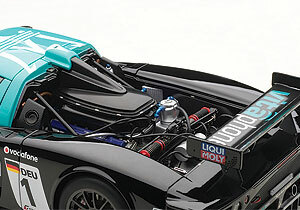 Detail is what makes Autoart’s Signature Series kits so realistic, collectible and gorgeous. This car, nearly 11 inches long is made of 471 metal and plastic parts, including 51 photo-etched plates and 20 chrome-plated parts. Under the rear bonnet the massive Maserati-tuned engine is beautifully cast with blue headers imprinted with “Maserati” in script, plus carbon fiber-look air box and scoop coming off the racer’s roof. Wiring and plumbing for the engine is nicely detailed too and two giant horizontal black and red springs highlight the rear and front suspensions. Under the hood are those shock assemblies along with giant cooling vents with mesh screens and five black hoses that snake to cool brakes and other components. Golden brown plastic shrouds also protect the front tires with the hood off. 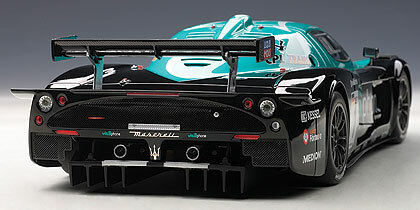 The rear spoiler features a carbon fiber look, as does much of the tail’s facing. Lights all look realistic and the tires are well labeled Michelin slicks. Other detail to consider, support struts that extend from inside the cockpit’s roof to the engine bay, metal door releases and giant metallic disc brakes behind beautiful smoked alloy racing wheels. Door hinges are metal and reveal a full racing interior, which means sparsely decorated, but with a well-formed racing seat and realistic shoulder and lap belts with metal central clasp. The dash looks good too with a center stack that extends out and angles toward the driver to make it easier for him to read gauges. That’s all well and good, but let’s face it, you’ll want to leave most of these metal body panels on the racer to display it in race trim. 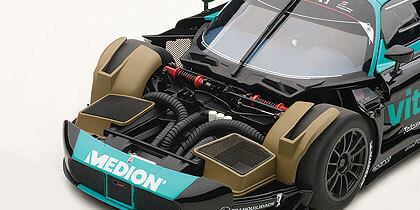 Although that engine bay is so sharp, you may want to lay the bonnet beside the racer if you have enough display space. 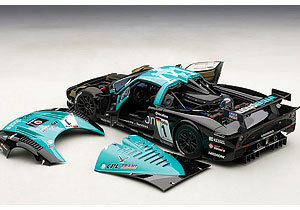 This is one sharply detailed and exciting looking racer in a scale that’s just right for showing it off to good effect.